Dress Clip Suspenders: This type of suspender comes with a metal attached clips. However, they are considered as less classy but they turn out to be convenient if you want to style with your pants which do not have button holes. But make sure you care them properly as they can damage the fabric when clipped on for a long time. Black Tie Suspenders: This type of suspender gives you a classy and an ultra glam to your outfit. They are known for this name because they are worn for 'formal black tie events'. Work Suspenders: Theses are heavy and rugged suspenders which provide flexibility of movement and are famously worn with heavy work pants or denims. Undergarment Suspenders: They are usually made from soft fabrics and their objective is a comfort, not style. However, they are designed to provide support and are worn beneath your undershirt. They are available in skin tones and are invisible. 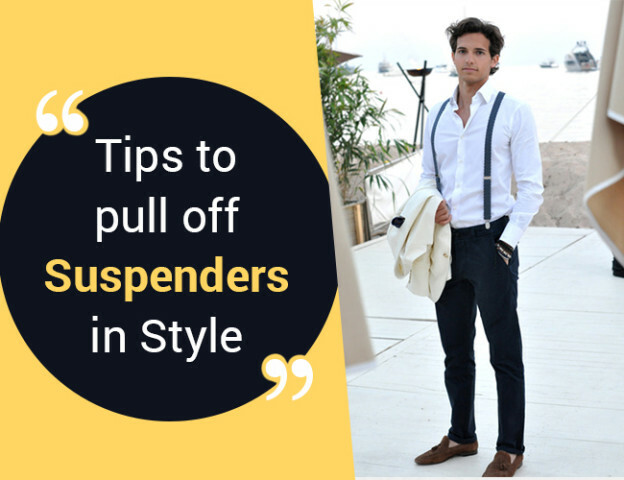 On a Final Note: So, all you handsome hunks add some charm and funk to your wardrobe with suspenders this season and flaunt your style.